Knockmore made the short tip from the shores of Lough Conn into Ballina on Saturday evening and went back home with a place in next Sunday’s senior football semi-final in their back pocket. Next time out they will be looking to put to bed the nightmare that was last years semi-final appearance when Ballintubber put nine in the back of their net at the last four stage. They came close enough to experiencing what it feels like to run up such a score themselves, finishing this quarter-final win with a 5-21 total beside their name. In the second half in particular Knockmore were clinical and composed putting up a score of 3-13 in the final 30 minutes. The crazy thing is that nine minutes into the game you would never haver predicted that the contest would end up with Knockmore handing out a 20 point hammering, at that stage they were trailing by 1-1 to 0-0 and Kiltane were well on top. Kiltane corner back Darragh Carey opened the scoring from a long range free two minutes in and he had the chance to double his sides lead from a tricky position close to the sideline three minutes later, but his effort drifted wide of the target. Four minutes later the first of eight goals in the game arrived. Tommy Conroy played a deft one-two with Stephen Gallagher and Tommy ‘Goals’ lived up to his name smashing the ball to the net from close range. Kieran Langan steadied the Knockmore nerves with a well taken score 11 minutes in and three minutes later Paul Jordan’s men were level. Langan fed Sean Rutledge who popped the ball off to Peter Naughton who was breaking through at pace and the wing-forward finished the ball to the net to leave the score at 1-1 each with 15 minutes gone. Two rapid fire points from Langan and Keith Rutledge pushed the saffron and blue side into the lead for the first time, before a Ultan Corrigan pointed free cut the gap back to one point with 20 minutes gone on the stop watch. But that was as good as it was going to get for the men from Bangor Erris, as Knockmore took total control of the game from this point on. Darren McHale, Colm Reape and Sean Rutledge all put over a flurry of scores, with McHale ending the scoring run with a well taken goal a minute before the break. Kiltane were able to tag on two more scores in injury time before the turn around, but they went in trailing by double scores on a scoreline of 2-8 to 1-4. Mikey Sweeney kicked the first point of the second half, but the next score was the one that killed off any hope that Kiltane had of producing a big comeback. Five minutes into the half, Colm Reape was on the end of a series of tightly worked at pace hand-passes and he finished to the net from close range and that was that as far as the outcome of this game. 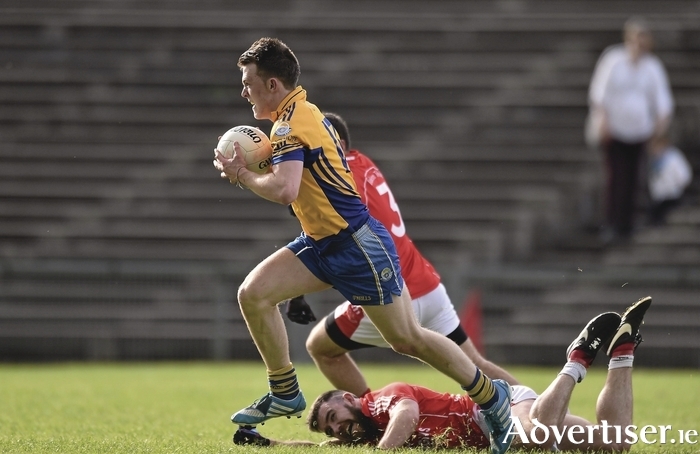 Kiltane would get two more goals of their own through Ultan Corrigan and one at the death from Stephen Gallagher, but Knockmore were just at a different level from them. Two more goals arrived through sub Alan Loftus and second for Colm Reape, while the added on 13 more points in the next 25 minutes as they laid down a marker of intent ahead of their semi-final meeting with Castlebar Mitchels next Sunday. Knockmore have never feared anybody in their lives and while everything on paper tells you that Mitchels should see them off next Sunday, that thought will have never entered the head of a Knockmore man. Knockmore: G Higgins; C Canning, S McHale, J Brogan; J Rice, S Walsh, A Stadler; T Clarke, K Langan; S Rutledge, K McLoughlin, P Naughton; K Rutledge, D McHale, C Reape. Subs: A Loftus for P Naughton, N Hardy for A Stadler, N Gillespie for D McHale, F O’Neill for D Walsh.